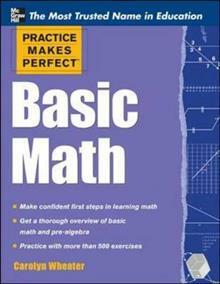 Get a thorough overview of basic math and pre-algebra --Cover. Carolyn Wheater teaches middle school and upper school mathematics at the Nightingale-Bamford School in New York City. Educated at Marymount Manhattan College and the University of Massachusetts, Amherst, she has taught math and computer technology for 30 years to students from preschool through college. She is a member of National Council of Teachers of Mathematics (NCTM) and the Association of Teachers in Independent Schools.